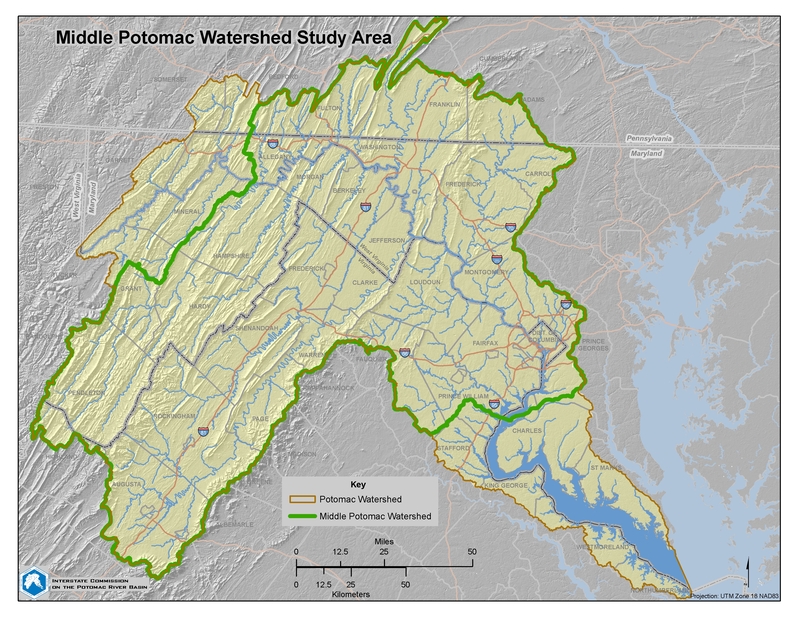 The purpose of the Middle Potomac River Watershed Assessment was to develop information resources and analytical tools that identify and assess human and environmental uses of streamflows in the watershed. This information will support regional planning for the sustainable use of the available water resources for multiple purposes, including ecosystem protection. While the watershed assessment concentrated on the Middle Potomac River watershed, comprising 175 river miles and home to approximately 75 percent of the Potomac basin’s residents, the assessment included hydrologic and ecological considerations extending upstream to the Potomac’s North Branch and downstream to the estuarine Potomac. Click here for the Middle Potomac River Watershed Assessment Reports. Below you will find information on project objectives, analytical approaches and tools, project products and benefits to stakeholders, and project partners and contact information. Cumulative hydrologic impacts of surface and groundwater withdrawals and impoundments. Condition and flow requirements for the basin’s aquatic species and ecosystems. Effects of land use change and increased impervious surfaces on river flows. Effects of climate change on river flows. Projected changes to water demand in the basin (including consumptive use). Relationship between hydrologic alterations and species and ecosystem health. A river’s hydrology is critical for ecosystem health; it directly impacts a river’s water quality, habitat value, and biotic integrity. The Potomac River’s hydrology, like all rivers, is defined by climate, geology, topography, vegetation, and other natural and human-influenced features of its watershed. This project employed a suite of analytical tools to determine the Potomac River’s environmental flow needs, assess alterations to the hydrology, and help water resource managers and decision-makers meet a variety of needs for our shared water resources. Ecologically Sustainable Water Management (ESWM) — An analytical framework to meet human needs for water in a manner that maintains or restores a river’s ecological integrity. The “ESWM” process includes defining environmental flows for species or natural communities of concern, assessing human influences on water flows, identifying areas of incompatibility between existing water uses and ecosystem needs, and, ultimately, collaboratively developing solutions to resolve any incompatibilities. Ecological Limits of Hydrologic Alteration (ELOHA) — A quantitative, data-driven analysis that uses biological and hydrologic information at the regional watershed scale to develop scientific understanding of the relationship between river flow alteration and ecological response. On the basis of these flow-ecology linkages, regional environmental flow standards can be set to guide water resource planning and allocation. This project assessed the impacts of current and future human activities on the river’s hydrology—including water withdrawals, dam operations, changes in watershed land use and development, and projected climate change—and explored how they might be balanced and mitigated to prevent water use conflicts and ecological degradation of the Potomac River’s native species and natural communities. A basin-wide database of biological and water quality data. A hydrologic model and database for the watershed. Development of future water use projections. Assessments of current hydrologic alteration and projected future alterations based on water demand and climate change. A literature review of basin-wide flow-ecology relationships. Development of environmental flow recommendations for the mainstem Potomac and classes of tributary streams, based on best available science and expert opinion, which can be used to harmonize jurisdictional water management decisions and policies across the watershed. Creation of hydrologic alteration-ecological response curves for classes of tributary streams that will aid in the implementation of environmental flow recommendations. A summary report that will inform a future basin-wide comprehensive plan. The success of this project depended on sharing data and knowledge among the multiple agencies responsible for water resource planning and management across the five jurisdictions of the Potomac basin. It also relied on the knowledge and expertise of academic researchers, watershed groups, and federal, state, regional, and local resource managers. Several expert technical workshops were held to solicit expert input and to transfer knowledge over the life of the project. These groups were well represented at the kick-off “webinar” held on September 29, 2009, to introduce the project. A two-day expert workshop to discuss environmental flow needs for selected large river segments was held during the third week of September 2010 at the National Conservation Training Center in Shepherdstown, W.Va. An eight-part webinar series was conducted between March 2011 and June 2012. It presented the building blocks of the smaller river and stream flow alteration-ecological response analysis, which used the “ELOHA” or Ecological Limits of Hydrologic Alteration approach (from Poff et al. 2010). A Technical Advisory Group was convened to guide development of the basin-scale flow alteration-ecological response relationships, and a November 29-30, 2011, workshop drew on the expertise of a larger group of technical experts from across the watershed jurisdictions to advise on the smaller river and stream environmental flow analysis. Reports, workshop materials, and webinars from these events are available. For more information contact Carlton Haywood.